New Town, ND - Dozens of people stripped down to swim gear and jumped into the ice-cold water of Lake Sakakawea this morning. As Jim Olson shows us, they did it to raise money to battle cancer. "Are you worried about this at all?" (Kim Marcucci, Plunge Participant) "Yes." And why not? They had to saw through thick ice to open up a slice of Lake Sakakawea for this. (Mark Fox, MHA Tribal Chairman) "This is the fourth annual, number four." This is the Ice Water Warrior Plunge. And MHA Tribal Chairman Mark Fox is the first one into the icy water. But many others followed, including a fellow tribal leader - from the Turtle Mountain Chippewa. And there were groups of jumpers - such as eight guys from an oil and gas pipeline company. (Trent Howard, Mandan) "I think it will be brisk." (You guys agree with that?) "Yeah! I think it'll be a little brisk, yeah." And when you're jumping into 33-degree water, you need a strategy, right? "I'm going traditional cannonball, it's my first year so I'm a little nervous." "This is my fourth year doing this and I might go with the belly flop again." But no matter the style, or the background of the jumper, every one did this for a very good reason. (Mark Fox, MHA Tribal Chairman) "The major thing is to raise money for the American Indian Cancer Foundation. (Ayla Salamanca, Minot) "My grandpa is the main reason I do this. He had throat cancer. He passed a couple of years ago. But my grandma beat it so I'm gonna keep fighting for her and do this for her every year." Ayla raised a huge sum of money for the cause - and delivered on her promise to jump again. 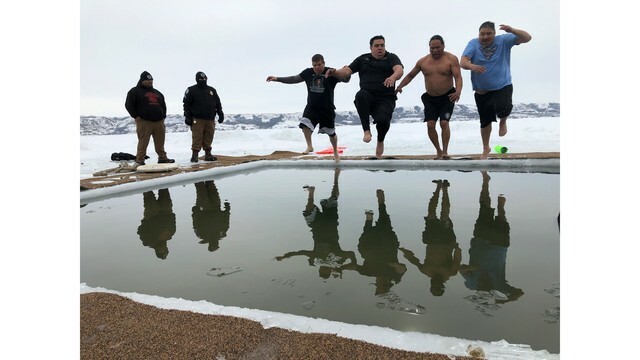 And so one after another splashed into the icy lake - surviving a few minutes of cold to give hope to cancer victims in Indian country. At Four Bears, Jim Olson, KX News. Chairman Fox says today's event brought in close to $70,000.